Summer is just around the corner and that means that many families will be heading out for some family fun. Whether you're hitting the open road or there's air travel on the horizon and you'll be relying on rental cars or taxi cabs once you get to your destination, BubbleBum wants your kids to remain safe while on your adventures. BubbleBum recently surveyed 500 adults aged 25-55 about child passenger safety and the results were a little surprising. Out of 500 adults surveyed, only 15.9% of them know that car booster seats are specifically made to keep the lap belt from rising up into the child's abdomen. Most thought they were to keep the shoulder belt from strangling the child and some even thought it was to help the child be able to see out the window. A staggering 32.8% of those surveyed have had to transport a child without a car booster seat, despite the fact that car crashes are the leading cause of death for children. 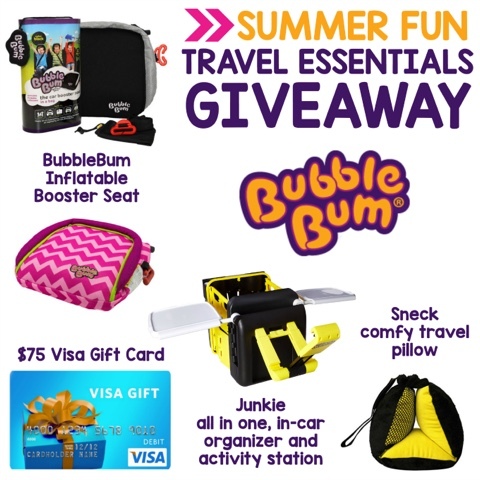 You can see why BubbleBum wants to spread the word about safety during summer travel, right? 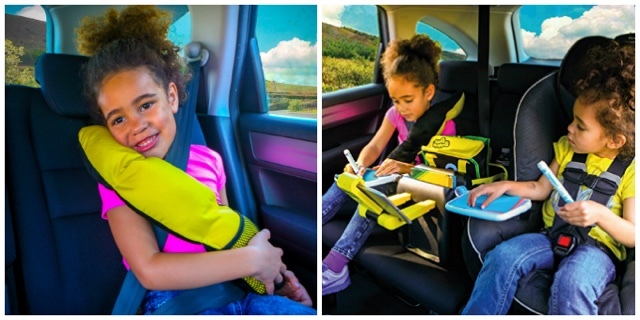 The BubbleBum Inflatable Booster Seat is designed for kids aged 4-11, giving them the perfect "boost" to help keep them safe in the event of a car accident. The boost prevents them from slouching (which is more common with flat car booster seats) by forcing them to bend their legs over the edge of the car seat. The memory foam technology within the BubbleBum design helps create stability and structural integrity in the seat, and it also features side positioners to correctly position the lap belt. The BubbleBum has been safety/crash tested in U.S. and Europe and has won 5 IIHS Best Bet awards for car booster seat safety. It's also won more than 20 design and innovation awards. You can get the BubbleBum at Target and Walmart for only $29.99! This convenient booster can go with your child wherever they go since it weighs less than a pound and folds into it's very own stretchy travel bag. Thanks to the BubbleBum, your child (or another young rider in your car) will never have to go without a booster again. It inflates by mouth quickly and easily in under 20 seconds and is reusable so you can use it time and again. The lightweight and compact design means that when deflated and folded, it can fit comfortably into luggage, backpacks, handbags, or even the glove compartment of your car. It's compact design also means that you can fit 3 across the back seat of most vehicles. Your kids might need a little extra comfort and a place to store and organize their stuff when you're traveling, and BubbleBum has you covered there too thanks to their Sneck Travel Pillow and their Junkie Car Organizer. The Sneck pillow system is a travel pillow with multiple uses. It’s innovative design makes napping in the car more comfortable thanks to its micro-bead pods and cozy material. It's perfect for car rides, bus rides, or plane trips. The Sneck easily attaches to the headrest with a Velcro strap that keeps it in place without having to reposition the pillow. It also features a stash pocket for storing MP3 players or small toys. The three way design allows kids to manipulate the position for optimal comfort. You can get a Sneck for only $14.99. Open to the US only, ages 18 and up. Ends at 5/4/16 11:59 PM EST. Enter using the Giveaway Tools form below. 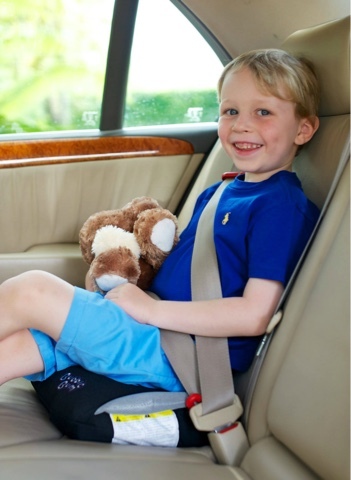 The packable Car Booster Seat is such a neat idea for traveling. I learned that these blow up to a safe booster seat and can be deflated in seconds to fit in a backpack. Love that the BubbleBum booster seat is for kids aged between 4-11 years! I learned that you can inflate it by mouth in less than 20 seconds. That is fast and convenient. It's for kids between 4-11.